The Chapter starts with lots of confussion from the United Sanctuary fighters. They don´t really know what is happening since two of the team Demise members have been defeated. The person calling him is Ibuki. He wants to ask him a favour...Since the time has come for the event that will define the Future. On Ibuki´s Hand there is the Depend Card. Chrono is checking his deck, he is waiting for the time his match with Taiyou, but the United Sanctuary Branch announces that they will go to an intermission since they must prepare and that the fight will resume when the management is ready. Tokoha says that maybe they are having this because they have lost two times in a row, so they mus feel some panic attack or something. Then Kamui comes in and invites them, with a serious voice, if they want to know the whole truth of what is happening on the United Sanctuary Branch. And of course our Heroes says yes! They are avoiding the Dog Trainers and it looks like they are searching for someone. Could be Kamui an Team Try3? Shion says that it is unlikely...Maybe other thing happened and that´s why the third match was halted. They reach to a door who needs a Key Card. Luckily, Kamui has one. So they enter! Chrono asks to Kamui about What Ibuki did. And Kamui says that yes, he did something, and he personally gave it to him instructions to go and see it personally! So Yeah, the one who gave it to Kamui the maps and Key Card was none other than Ibuki. They reach to a laboratory were the scientist are like headless chickens and it looks like Ibuki erase all the data, except his back up that he has now. Ibuki is the one who the Dog trainers are looking for. Kanzaki then comes in and tells them to calm themselves. A Scientis comes and gives him a note that it looked like was for Kanzaki. Ibuki Got Biblical! He is citing the Genesis 3:19. Kanzaki Chuckles and says that then he, Kanzaki, is dust ,eh? That´s a Good One! still Kanzaki says that Ibuki will pay for what he did. The Dog trainers have captured our Heroes! they bring them to Kanzaki who says that it looks like they are truly interested in the United Sanctuary Branch. Kanzaki then will proceed to took the cat out of the Bag. That laboratory has been made in order to awaken the “Miracle Card”. Oficially called the Depend Card, a Card that in the hands of some powerless it is nothing more than a white cardboard. But on someone worthy a Miracle will happen! But it also needs the power of imagination of the fighters when they battle, all of their neural procesing things...and imaginashon! those are the forces that feed the Depend Card and make it more probably that the miracle happens. That power is oficially called: Stride Force. What hides the Depend Card is a unit so powerful that it can even shape our own reality. Our Heroes, sans Kamui, don´t understand quite well what is happening. Kanzaki acts like if that was normal...But he also says that he sought once that Miracle. And his intentions to recreate it are the very own reasons of all of this. The Strenghteen program, the Depend Card, everything! Now with all of that. The Depend Card is no longer here. Chrono says that Kanzaki must Get Stuffed! ...Yesh Chrono that mouth!. Anyway, Chrono keeps saying that what he did to Taiyou and all of the United Sanctuary Members is unforgivable..And all because some Nonsense about a card that does things in a Trading Card Game?! Our heroes are really mad now! Kanzaki only respond with “Weakness is a Sin” that it doesn´t matter how the stronght treats the Weak, the Weak has no right to rebel. Kanzaki is leaving. A Scientist tells him that he will work with the others in order tor estore the data, while the Dog trainers search for Ibuki. Kanzaki responds him saying that they shouldn´t bother...Since Knowing Ibuki, he deleted them completely and he must be far, far away now. Kanzaki thoughts that he nows must take it back... But for now, Ibuki must guarded it with all he has. Meanwhile the United Sanctuary Members are quite confused at what is happening, since Team Demise has lost 2 times now. Some of them still have hopes for Taiyou, that he can win! Our Heroes are back with the Card Capital 2 crew. They explain to them about that Miracle Card...And they are as confused as them. It is a Powerful Card?, it is something Magical?, Kanzaki was probably High on drugs when he sought the Miracle? Who knows. All of them are mad about what is happening on this branch, since how Kanzaki treats his fighters! Also Shion wonders why Ibuki stole the card? if he was in chage of the programs. Jaime then starts remembering something. That the person who gave him the card when he was on the airport was none other than Ibuki. Meanwhile, Chrono is talking with Kamui about Taiyou and his situation on how Taiyou was used by Kanzaki, how Taiyou trusthed on the United Sanctuary branch with all his hearth. How he became a member of Team Demise. How Hard must have tried Taiyou...And how Kanzaki was using him. Chrono is mad and will face Kanzaki. For Taiyou and all of the United Sanctuary fighters! Kamui the gave it to him a... White cardboard? Kamui tells him that Ibuki asked him to gave it to him. Chrono remembers Kanzaki´s Words about that the Depend card is a White cardboard on the unworthy...But for the one whi it is. A Miracle will happen. Chrono yells amazed. But Kamui says that he must be silent! Ibuki gave it to him alongside the map and the Key Card. Ibuki also says that this is something that only Chrono can do. Chrono doesn´t know what he meant to. But Kamui tells him that Ibuki will explain all to him after this is over. Kamui keeps speaking saying that if Kanzaki filled that card with everyone´s imagination then...Taiyou one must be in there too. And speaking of... Taiyou was in there, and he is surrounded by a group of interested people who he calls that are his “Friends”, because he is strong now. In Spanish there is a saying that says: “El Interés tiene Pies” , which means something like “The Interest has it´s own legs” and i think that it is the case. Anyway. Taiyou says that he will face Chrono and will come out witht he victory. And with that he will show it to him all the pride and strenght the United Sanctuary branch believes in! Chrono was about to tell him all the truth; but Kamui stops him. Chrono then says that he is waithing to fight with him. The Announcer says that the final between Team Try3 and Team Demise will be on 15 minutes. So all of them be ready. Meanwhile Kanzaki is riding his horse thinking that this is the first time in a lot of time where he had to chase something. He also remembers the time he sought the Miracle...And it looks like it´s user is a Woman. When he sought that unit that went beyond the realm of reality. He swears to obttain that power and face it again and win this time! Meanwhile Ibuki now is on Shibuya, he has confused with the people and is going as far as he can...Or to his House, it doesn´t matter. Until he is stoped by Shouma. Both of them goes to a silent place and Shouma was saying that it is a tragedy that Ibuki has left the United Sanctuary, since he was hoping to be retrained by him. Ibuki says that´s bull, since Shouma have no intentions of going back. He responds saying that he is right, is he so transparent? Ibuki was preparing to leave, but Shouma attacks him! Ibuki blocks! Shouma asks that why is Ibuki doing this? Maybe he is trying to compensate something he did on the past? Shouma attacks again and Ibuki Blocks! Shouma asks why is he so attached to Chrono, or maybe it is Gear Chronicle? What is with him? Ibuki remembers when he was on the desert and he spoke with Chrono´s Dad, Ibuki confess to him that he Comitted a Sin (Watch the Movie for some hindsight on that) and now is trying to compensate things. Then Chrono´s Dad shows to him the Chibi Chronojet Dragon. And he speaks to him about a final hope...Something that is real...The Depend Card, who has the power to trascend the World. Also that something or someone is trying to do something bad...And the Depend card is the only one who can stop it. But if that person doesn´t have imagination it can become corrupt and just like that someone. And if that happens...That world, but also ours will suffer. Now Back with the present times. Ibuki attacks and punchs Shouma´s Belly! Good for him! that Sociopath needs to learn a lesson! 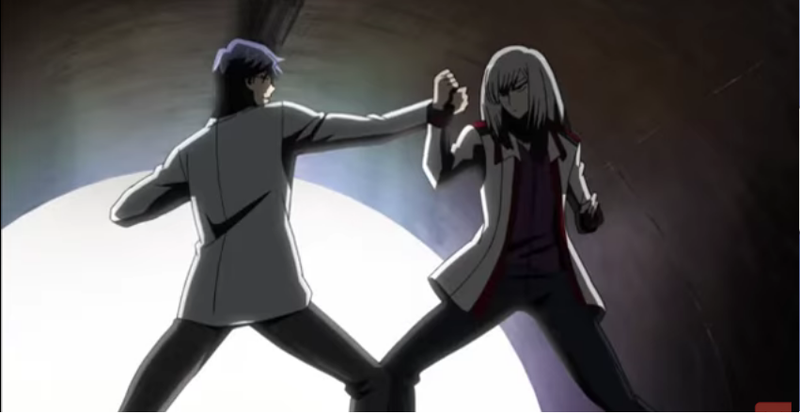 Ibuki has won against Shouma! he ended saying that there is no need to fight against someone who doesn´t intend to draw triggers. and Ibuki Leaves. Shouma starts laughing like a mad man and basically says that this is not the last of him! Shouma gives me scary vibes! that guy is surely dangerous! Chrono is ready to fight against Taiyou...And he is ready to fight Taiyou..And deliver the Vanguard he believes in! Awesome Chapter! Full of Blowout reveals! We more or less know what is the Depend card, Ibuki intentions, Kanzaki intentions and even Shouma ones! But also...There is a feeling that we only know a litle part of the whole truth... The Mystery is getting bigger and bigger, like: Who was that person who beated up Kanzaki? What does Shouma Tries to do? and What does Chrono have todo with this?